Historically, kalamkari fabrics were used to tell a story. Artists would create gorgeous kalamkari textile paintings to put history down on record. Kalamkari became so popular during the Spice Trade that it was used as currency in some parts of the world. These days, however, kalamkari is mainly used for decoration. You can buy kalamkari bags, pjs, bedspreads, curtains, saris….you name it! Kalamkari is made in several parts of India today, but most is made in Andhra Pradesh, in Southern India. It takes a long time to make, which is why you don’t see it everywhere. The popularity of kalamkari has ebbed and flowed throughout the centuries, and really took a dive in the 20th century. But lately it’s seen a surge in popularity as more people start buying ethnic goods. 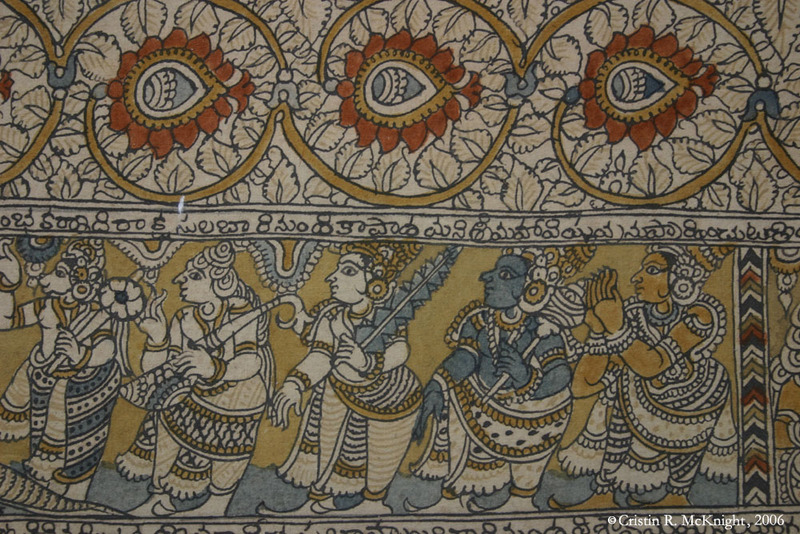 If you’d like to see how kalamkari is made, this blog has some wonderful pictures that illustrate the entire process. The cool thing about kalamkari is that it’s so rich and colorful. Some fabrics show mythic tales from Indian mythology. Others are gorgeous block prints of flowers and scrollwork. The detail is very fine on some pieces, and very general on others, so overall there is a wide array of designs. The great news I have to share is that soon we’re going to be carrying kalamkari bags here at Earth Divas! Ed is still in India sourcing fabrics and vendors for our new wave of bags, and he has found a wonderful little design shop in Chennai that is going to provide us with kalamkari fabric. Whoo-hoo!